John Lo Bianco, 18, played soprano with the Lehigh Valley Knights in 2002. He's playing with Magic of Orlando this summer. 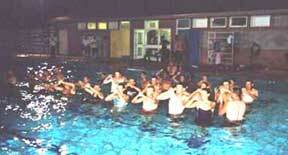 "This picture is of the Lehigh Valley Knights 2002 corps doing basics block in the pool after a rehearsal day. The housing site was nice enough to open up the pool for us after seeing us work so hard. It was the hottest rehearsal of the summer. This picture was taken in Canada." Thanks John! View the Forzato archives E-mail your Forzato submissions to dave@dci.org along with where and when the photo was taken, and send some biographical information about yourself as well. We'll give you full credit. Also, let us know if you want your e-mail address included, to get feedback from other drum corps fans.